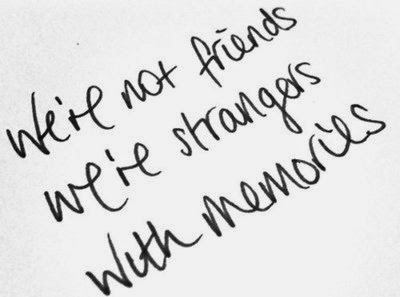 The strangers in your Life are sometimes those who you think you know very well! It’s possible that you have faced this before. That people who you think are close to you are the ones who want to distance from you just because something’s gone wrong in your Life. Or they are the ones who emotionally disrupt and challenge your Life the most! I have experienced being treated this way and I know what it means and how it feels. Not all people are this way, but when people close to you, like your parents, or siblings or your close family, behave distant, or choose not to be understanding, it numbs you. Over time, however, you learn to move on. Because that’s the simplest and the most intelligent thing to do. A friend shared with me that his brother has been fighting with him over a property dispute. Their father had bequeathed specific parts of his real estate to the two brothers. But the older one, leveraging some ambiguity in the father’s will, was staking claim to my friend’s share as well. The matter is in court. But since the two brothers live in the same building, though on different floors, my friend lamented that his brother does not let a day pass without a verbal duel. “I am tired of all this bickering. My children are affected by this daily drama. He just comes daily and launches a tirade against me, calling me an ‘usurper’ and a ‘cheat’. At one level I find all this so petty and banal. I am hurt not because he wants the property but because of all the insinuations that he makes,” said my friend. I can empathize with my friend. But there’s nothing shocking about this. This happens in almost every other Indian family. Money, property and other material assets often divide people. Family or close friends become, sometimes, worse than third party litigants. So much acrimony then follows that at the end even if the dispute is settled legally, the relationship is over. Forever. I have learnt that one way to mitigate the damage, not so much to protect the relationship, but to protect your inner peace, is to not engage in any conversations if you find the other party – be it parent, sibling, spouse or friend – “un-relatable” anymore. Which is, if you can’t relate to that person anymore, just don’t converse with him or her. You don’t have to sulk. You can just choose not to react at all. Let whatever that needs to be settled, be done so through a legal – or any other mutually agreeable – process. If someone has the right to talk nonsense and heap insinuations on you, remember, you too have the right not to listen to them. You possibly want to, and of course have the right to, pay them back in the same coin. But arguments are always futile. No one wins. And the biggest casualty is your inner peace. So, simply choose to ignore what is being said. Focus instead on what needs to be done to resolve whatever dispute separates you from the other person. Most important, however, is to know that people do what they do to you because they believe they are doing the right thing. It is another matter that you feel wronged. In all such cases, if you can let go and let the other person have all that she or he wants, fine. But if you must fight for what is legitimately yours, start with choosing to protect your inner peace. Because, only when you are peaceful, can you think clearly and resolve any dispute, logically and legitimately. Don’t fight Life, flow with it!